The scene is played for laughs, but there is an underlying truth. The US government has historically avoided harm reduction policies in favor of strategies that are less controversial, but also woefully ineffective. Syringe exchange programs have existed in the United States since the 1980s. They were created by community activists, without government support, as a response to the AIDS crisis. 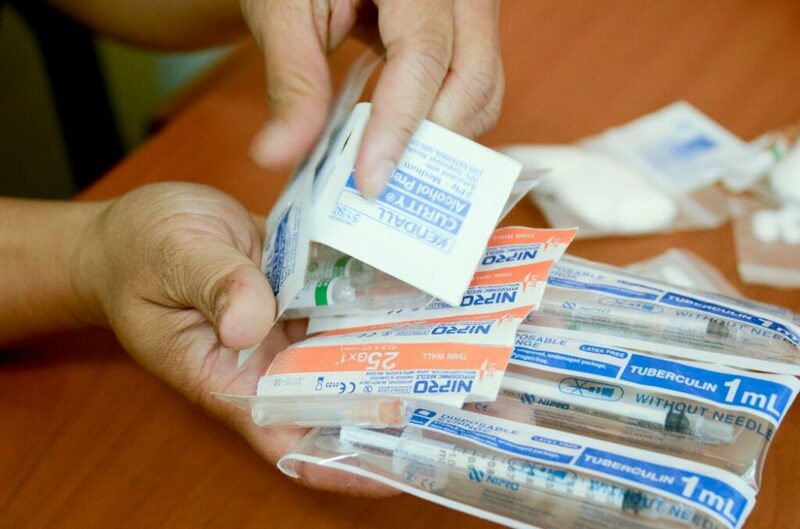 Since HIV is transmitted through blood, distributing clean needles reduced the risk that somebody could become infected with HIV after sharing a needle previously used by an HIV-positive person. Indeed, countless studies have shown that access to clean needles drastically reduces infection rates of not just HIV, but infections such as Hepatitis as well. In addition, those who repeatedly reuse needles risk a variety of infections. By providing drug users with clean, sterilized needles, syringe exchange programs are one of the most effective forms of harm reduction. As the opioid epidemic leads to increased rates of heroin use, syringe exchange programs are more important than ever. Unfortunately, draconian laws at the federal level and in many states make it extremely difficult for syringe exchange programs to help the people who need them most. U.S. Code Title 21 Section 863, also known as the “drug paraphernalia statute,” bans the distribution of drug paraphernalia. The Department of Justice defines drug paraphernalia as “any equipment that is used to produce, conceal, and consume illicit drugs,” a category broad enough that they mention “miniature spoons” as potential paraphernalia. There are 15 states in which it is illegal to run a syringe exchange program, a diagonal stripe across the country from Idaho to Florida. In these states, which make up the bulk of the Midwest and the Southeast, drug paraphernalia laws forbid individuals from selling or distributing syringes if they have reason to believe that they will be used for illegal drug use. But even in states where syringe exchange programs are legal, hurdles created by state and local governments, as well as local law enforcement, make it unnecessarily difficult for harm reduction organizations to ensure that drug users have access to clean syringes. Illinois is one of the few states in the Midwest that allows syringe exchanges, but the onerous restrictions placed on these programs make the work far more difficult than it should be. Organizations like The Chicago Recovery Alliance must obtain a “research exemption” in order to distribute syringes, a barrier that makes it harder for them to reach the people who need them most. And there is, in fact, no need for more research on the efficacy of syringe exchange programs. Mountains of evidence show that such programs are cost effective for cities and states and that access to clean syringes lowers rates of HIV infection without leading to increased rates of drug use. Effective syringe exchange programs save lives and make communities safer. This has not stopped towns from shutting down needle exchange programs, or preventing them from opening, based on unfounded fears. Last year the mayor of Charleston, West Virginia forced a local syringe exchange program to shut down, claiming that too many used syringes were being found unreturned. This was a baseless claim; 9 out of every 10 needles distributed were returned to the program. Earlier this month, Scientific American dug into why so few syringe exchange programs exist in Virginia, one of the states hit hardest by the opioid crisis. One of the issues, they found, is that “the law [requires] any local community to obtain formal written consent from local law enforcement officers for programs to operate,” and “continues to criminalize possession of even sterile syringes” for the program’s customers. As a result, only three of the seventy-five eligible counties in Virginia have a syringe exchange program. The opioid epidemic is worsening by the year; more people are going to be using heroin, often without the resources they need to stay safe. Harm reduction is about helping people stay safe while offering them whatever support and assistance they need. No program does that more effectively than syringe exchange programs, yet too many states are stuck in a War on Drugs mindset that punishes and stigmatizes drug use. That approach has failed, and harm reduction is one of the new strategies that must be embraced.